The front door of The Old Band Room is on a quiet gravelled lane and opens directly into the open plan ground floor of the property. The ground floor has the following areas:	Living space: A lovely area, with a wooden floor, oak beams and an electric flame effect fire. There are two leather sofas and a flat screen TV with DVD player;	Dining area: Contains a wooden dining table and seating for up to five;	Kitchen: The modern, well presented kitchen area contains a range cooker with a five ring gas hob and two gas ovens, a dishwasher, fridge, freezer, microwave, kettle, toaster and washing machine.Stairs lead up from the ground floor to the first floor landing, off which are the following rooms, all in the eaves of the cottage, with lovely oak beams and exposed Cotswold stone walls:	Bedroom 1: Contains a double bed and a comfortable leather sofa. There is also a lovely ensuite bathroom, with a walk-in shower, toilet and a wash basin;	Bedroom 2: Contains a double bed. There is also a door giving direct access into bedroom 3;	Bedroom 3: This is a small bedroom, with no window, which can be accessed either directly from the landing, or from bedroom 2. The bed in the room is also small, measuring approximately 75cm x 167cm/2'6"x5'6", and is only suitable for children under the age of 12;	Family bathroom: Contains a bath with handheld shower, toilet and wash basin.Across the lane from the cottage is a gravelled garden area, with a lovely, shallow stream running past at one end. The peaceful garden contains a picnic table and a separate smaller table, with ample seating for five, plus a charcoal barbecue. The Old Band Room is a traditional Cotswold stone property, with a wealth of character features and an interesting history, having once been used to practise in by the military bands of the surrounding villages. 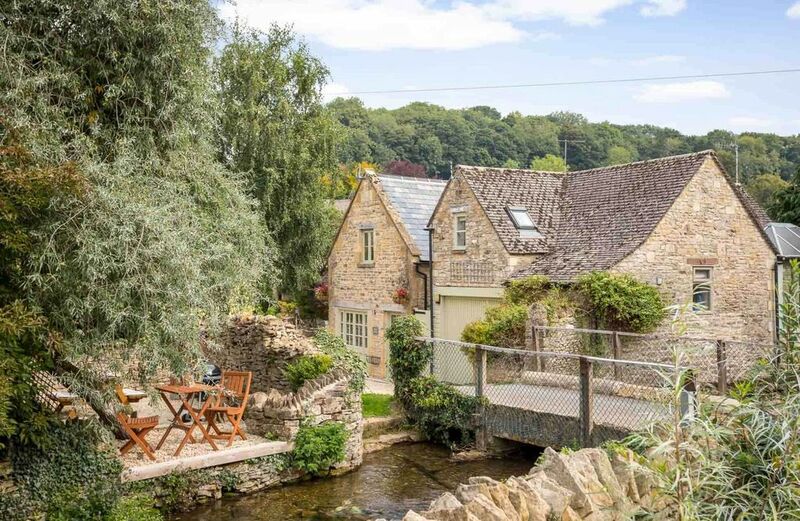 The cottage is located in the heart of the popular and picturesque village of Naunton, which is set well away from busy roads and benefits from a good village pub, a golf course and many beautiful walks straight from the doorstep. The well known market towns of Stow-on-the-Wold and Bourton-on-the-Water are both within six miles, with their wide range of pubs, shops and restaurants. Naunton is also within easy reach of many tourist destinations, including Oxford, Blenheim Palace and Stratford-upon-Avon, the birthplace of William Shakespeare. The cottage has lots of traditional character, including oak beams, wooden floors and exposed Cotswold stone walls. Complementing these character features, the cottage has modern facilities, including a TV with DVD player and a well presented kitchen. The Old Band Room sleeps a maximum of five people (4 adults and 1 child), in three bedrooms, with two bathrooms. There is a lovely garden just across the lane from the cottage, which sits on the shallow stream runnng through the village, and quiet, on street parking is available close to the cottage. The Old Band Room is perfect for families or small groups of friends looking for a peaceful break in the heart of the beautiful Cotswolds region.